γνῶθι σεαυτόν - Know thyself. The study of Classics is central to the ethos of the school but the aims of the department go far beyond passing examinations and memorising grammar books. Inherent in the ethos of the Classics department, is a desire to encourage children to learn about themselves and become independent thinkers, who appreciate and uphold the values and importance of self-discipline and hard work. Classical languages are rigid and abstract disciplines which reward the persistent and logical thinker and our aim is to promote the challenges and rewards of learning the languages, through an overtly grammatical approach. Classics is started in Year 3, through mythology, proverbs, songs and storytelling and at the beginning of Year 5, pupils are introduced to the Latin language - the basis for classical culture and the root of Western civilisation. A non-linguistic course which serves as an introduction to the Graeco-Roman world is also studied throughout, where the structure is topical and incorporates a broad view of classical history and culture. The aim is to stimulate an informed interest in the ancient world, as a compliment to the learning of both Latin and Greek. Greek is introduced in Year 7. 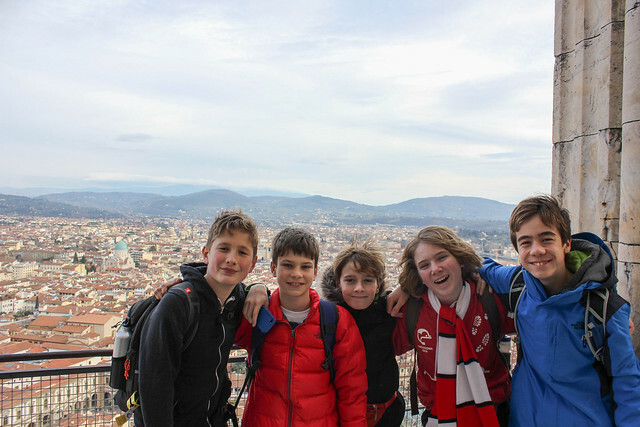 The school runs many classical trips which begin in Year 3 and culminate in an 8-day trip to Italy, studying the classical art and architecture of Ancient Rome and the wonders of the Florentine Renaissance. Geography explains the past, illuminates the present and holds the key to our future, what could be more important than that? Geography comes alive at Dolphin School! From a very early age, Dolphin School children are empowered to understand the world around them first-hand; they are given the tools to engage with geographical questions and themes, in an exciting and practical way. Whether taking part in Forest Schools activities in Nursery or studying demographic processes at Common Entrance, pupils are encouraged to think of their world as a series of links in a holistic and integrated manner. In this way academic success is first class, yet not the focus of their learning. Pupils are encouraged to become global citizens and to reason, review and respond to global issues by addressing real life issues that are topical and current. We achieve this through exciting and differentiated learning, with pupil-based activities at the heart of the classroom environment. Experiential learning is embedded via the extensive range of subject-based day trips. A wealth of residential trips which include walking on the South Downs studying coastal features, completing a river study in Snowdonia National Park and a week in Italy and the French Alps, leaves a lasting impression on the pupils' lives and helps to make Geography at Dolphin School extremely inclusive and most importantly, meaningful, enjoyable and relevant. History at Dolphin aims to teach children about past events in a factual way but also to develop a curiosity and questioning approach which can be applied in a wider context. Source analysis and essay writing allow children to develop analytical and literacy skills which will be useful throughout their lives. We see the study of history as a means of understanding the world in which we live, by learning about how and why it has come about. Whether that is looking at Cromwell in Ireland, in order to understand the context of the more recent ‘troubles’ in modern Ireland, or visiting the castles built by Edward I in North Wales as a means of appreciating the impact of invasion and conquest. History is above all, the study of human behaviour and children learn about themselves and their society in a uniquely meaningful way. We pride ourselves on being able to make past events relevant and interesting to our children. We are fortunate to visit numerous historical sites which help to bring history alive. The world we have created is a product of our thinking; it cannot be changed without changing our thinking. Dolphin's Earth Studies programme adopts an innovative approach to exploring global issues and our responsibilities towards Planet Earth. We support our pupils in gaining a deeper understanding of the science of life on Earth and the options our young people have moving forward into adult life, in a balanced and mindful way. Earth Studies explores aspects of identity, the natural world, philosophy, science, mythology, globalisation and spirituality. We draw on ideas from cultures across the globe, both ancient and modern, and we explore the role of government, international bodies and the media. We live in a melting pot of cultures and beliefs, surrounded by people who see the world through a different lens to our own familiar version. Respect for difference and unravelling prejudice also will be explored. Through Dolphin's Earth Studies programme, pupils conclude their Dolphin School career with a deep understanding of how the world works, how our lives are interconnected, how our life choices and consumer behaviour has a deep impact both locally and globally and how an individual can bring about change. I have a dream that no-one, NO-ONE, will be alone without love, a home or a community. This is my dream and we can achieve it."